Wigtownshire were on the road again on Saturday for the first time since the beginning of January. They are now playing games that were cancelled earlier in the season due to unplayable pitch conditions. This can be a difficult time for the local boys. The grounds might be playable now, however, Wigtownshire getting a team can be an issue. Work commitments as the season runs on, restricts player availability, causing a serious problem. This situation resulted in their game the previous Saturday being called off, which will undoubtedly result in a point deduction in league as a consequence. Loch Lomond whom they faced on Saturday have had a difficult time in the league themselves this season, but have posted some better results recently, particularly at home. 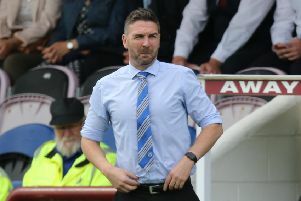 The match was very unlikely to be an easy one for the visitors, particularly with the many changes in personnel taking to the field for the “Shire”. With three of the squad making their season débuts, including the return of veteran prop, Simon Taggart, Coach Campbell McGregor even had to add his own name to the roster to meet the requirements for “Front Row” cover. A hard day at the office was expected by everyone making the journey. Things did not get off to a good start. Utility front row forward Craig Dickson sustained an ankle injury during the warm up and could not start. It was cold but dry when Wigtownshire kicked off on a pitch that was firm underfoot but one or two puddles showed it was still very wet in places. The visitors started well putting Loch Lomond under pressure from the off. Unfortunately a knock on by “Shire” just short of the line allowed them a chance to turn over ball and clear the danger. “Shire” came straight back on the attack and eventually their efforts were rewarded with a penalty at the break down. Jason Gallacher stepped up and kicked the goal to open the scoring. From the restart “Shire” recovered the ball again denying the home side possession and any easy opportunities to come back into the game. Once more they made use of the possession to keep their hosts on the back foot. Loch Lomond did get their hand on the ball but found it difficult to gain any field position. Wigtownshire came on strongly. The ball was shipped wide through hands of the backs and found full back Tyrell Wilson who joined the line. Wilson made good yards, stepping through a number of defenders before passing the ball back inside to centre Andy Farquhar. He used the ball well, shipping it inside again to his stand-off John Dalrymple. He went over the line to score a try from a move started in his own half. Unfortunately the conversion attempt slipped wide of the post. The remainder of the half was played out with Loch Lomond coming back hard trying to recover the ground they had lost. “Shire” met their efforts with determination and purpose. Unfortunately in their efforts they slipped into a re-occurring problem of offending at the break down. Loch Lomond were unable to capitalize on this before half time and the score remained at 8 points to nil to the visitors when the break was called. The home side went on the offensive from the restart and their efforts drew further break down offending from the “Shire”. This matter was addressed by the referee by means of a yellow card shown to Wigtownshire Captain John McIntosh. Reduced in strength, the Loch Lomond attack broke the “Shire” resistance. They drove their advantage home and despite the best effort of the visitors, scored a try. The conversion attempt fails. Heartened by their score the home side came straight back again from the restart. Only very determined effort in defence held the ball up when Loch Lomond crossed the line again. It did give “Shire” an opportunity to clear their line from the ensuing scrum. They weathered this storm until restored to full strength, hoping to recover the ground they had lost. Given all the issues, the player shortages, the injuries and the yellow cards, this was a great result for Wigtownshire. On the day the players who made the journey showed great determination and commitment. They worked very hard for each other and managed to get the win. John Dalrymple, playing at Stand-off, was noted as having stepped up to the mark. As well as scoring his side’s only try, he was awarded the accolade of Coach’s Man of the Match. On the down side the matter of penalties and yellow cards still needs to be addressed. Also the injuries sustained will add to the availability woes as the team prepare to face Birkmyre at Kilmacolm on Saturday. The “Bears” as they are known, have got their season going recently and like Loch Lomond, have had some good results recently. If they continue on form they are on track to overhaul “Shire” in the League. The Wigtownshire boys will have to be on their game for this one, and at full strength, to get the result they would like. Team: T Wilson, J Gallacher, A Farquhar, J McIntosh, K Little, J Dalrymple, C Lammie; C McGregor, G Keith, C Dickson, R Dewar, G Dunlop, J Little, A Preston, A Paxton.